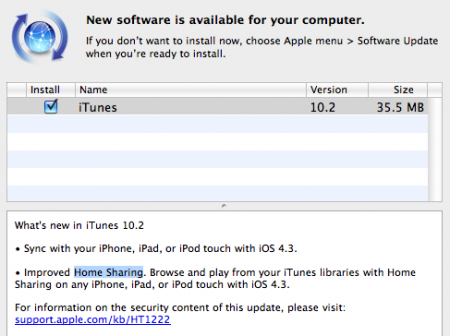 Apple has released iTunes 10.2 which provides support for iOS 4.3 features and some security updates. iOS 4.3 will be released March 11th. We compiled what we know about iOS 4.3 in this post. â€¢ Sync with iPhone, iPad, or iPod touch running iOS 4.3.
â€¢ Security updates. more information. The update is available on Apple’s website: iTunes 10.2 and for 64-bit Windows: iTunes 10.2 for Windows (64 bit).